You are here: Home ▻ Etc. ▻ Door Hanger Pro: What It Is & Why You Need One! Door Hanger Pro: What It Is & Why You Need One! 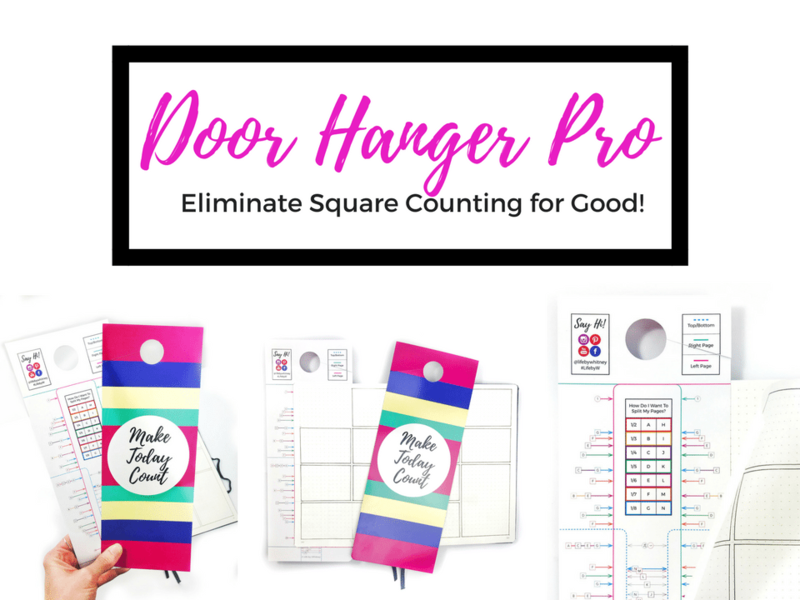 The Door Hanger Pro is a tool to help split your pages into equal sections without calculating a THING. 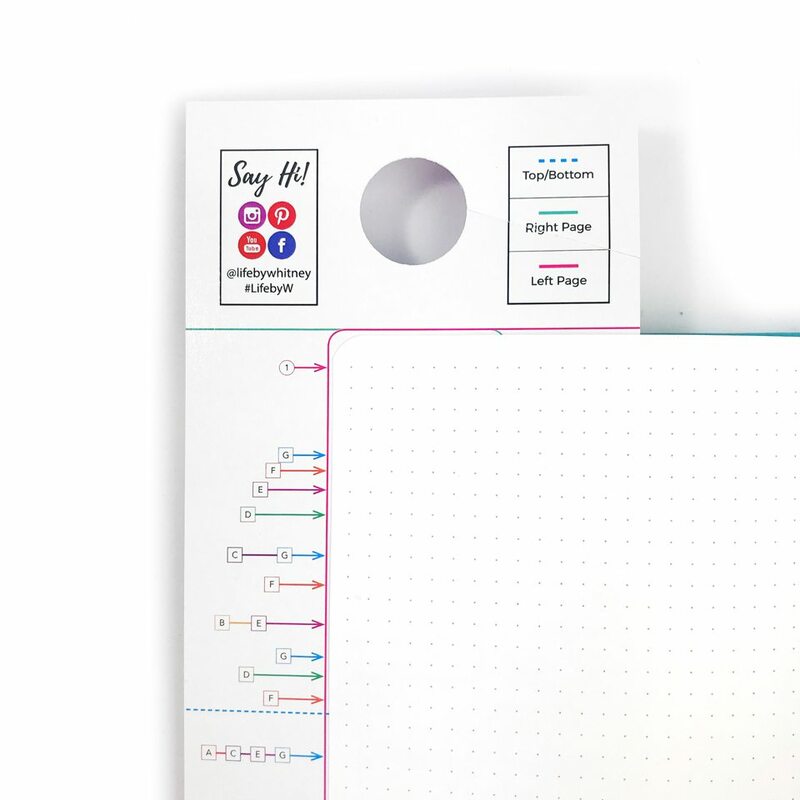 It slips right under the page (top, left-side, right-side, or bottom) of your A5 notebook & points exactly to where to draw lines if you’re wanting to split your page into separate, equal-sized sections. My latest spreads on the blog that I’ve shared use the Journal Companion for reference. I created the companion so you can use my spreads even if you don’t have the Leuchtturm journal. Simply put, the Companion is a reference table that shows exactly where to add your lines if you want to split your pages into equal sections. (Read more about the journal companion here or watch the How-To video). The Door Hanger Pro eliminates the need for the Journal Companion table – and takes away any numbers and calculations involved. Every time I make a layout, I have some sort of base grid that I’m using to create it. I typically will use a pencil for the grid before I design the full layout in pen and add color. All of my older layouts a directly compatible with the Leuchtturm 1917 A5 journal (a 26×38 grid size). I created the original door hanger for the LT A5 journal to eliminate having to pencil in my numbers around the side every time, but I was still having to calculate numbers when I wanted to make equal sections on my pages. For example, if I wanted to make a grid with 3 equal sections tall and 2 wide, I would still have to calculate what ⅓ of 38 & ⅔ of 38. Then I’d take half of 26 to make my grid. I made the free Journal Companion as a table to do just that, but I still wanted to make it EASIER. 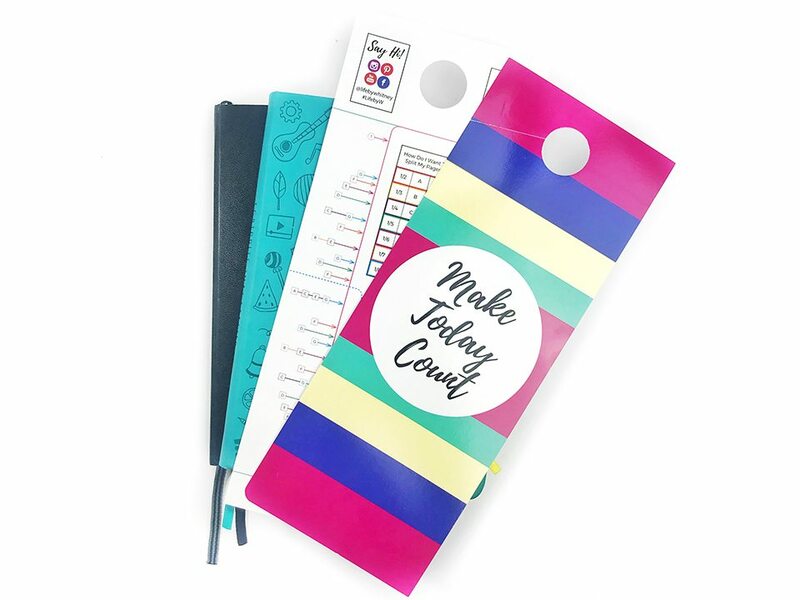 This is where the Door Hanger Pro comes in – it’s a tool that combines the Journal Companion AND the original door hanger to split your pages up into equal sections without a number involved! Want more inspiration? Join #journalyou52 to see EVERY gallery. All you have to do is ask yourself if you’d like to split the height or the width of the page and how many equal sections you’d like to split it into. Look at the table on the hanger and you’ll see which reference lines to look for. Slide the hanger under the page in your book and use a pencil to mark where the letters point and you’ve got yourself an equally sectioned off grid! The door hanger can also be used as a ruler when drawing your penciled grid and pen marks when it’s time to commit. The hanger fits perfectly in the Leuchtturm journal and the Scribbles that matter journal. If you’re using the A5 Leuchtturm dotted journal, line the top 1 up with the middle of the top row of squares (like the original door hanger). If you’re using the Scribbles that Matter journal, line up the top “1” arrow with the very top corner dot. Along the bottom and the top, line up the longest guideline (A,C,E,G) with the middle of your notebook, you can gently fold your page in half and crease the bottom to find the center point of your page. All of my future layouts will reference the Door Hanger Pro and will make them super easy to transfer! PLUS, you can come up with your own by making your own grid. You don’t HAVE to have the Pro to transfer my new layouts – I’ll still have the dot grid for the Leuchtturm journal in the background – but this makes it a lot easier for those without that particular journal to use. The free Journal Companion shows you the same reference points and be sure to email me if you’d like a custom JC made for your journal size. Eliminate measuring time when drawing equal size sections (vertically and/or horizontally). Make rows and columns the same size without even thinking! Quickly, easily make monthly calendars – using the 7 rows wide & 4 or 5 rows tall ~ depending on the month. 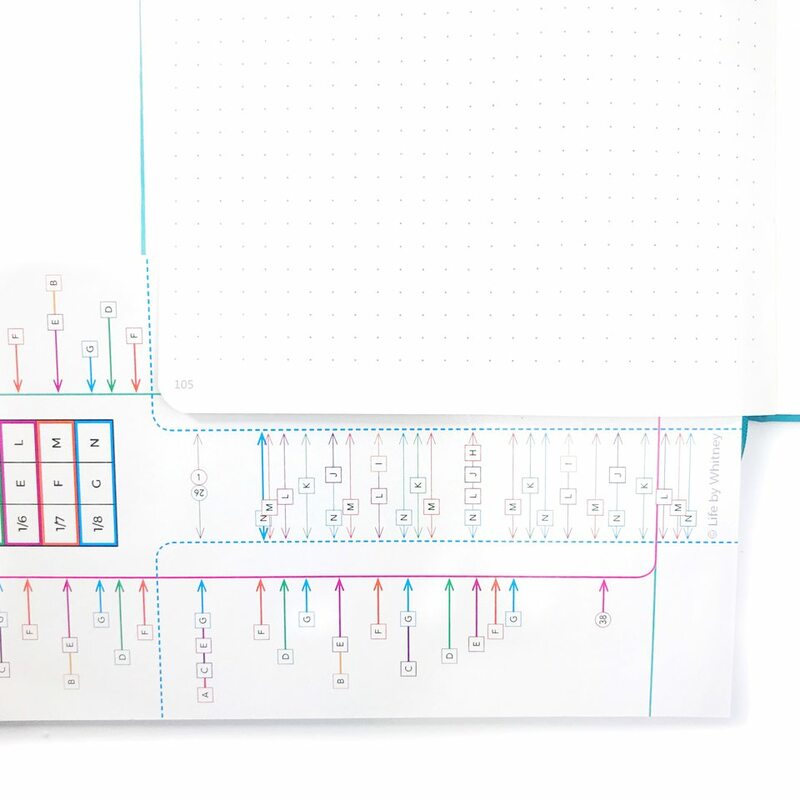 Make your own grid guide even if your journal doesn’t have dots or lines. Eliminate the need for the Journal Companion table or calculations. Easily transfer my new layouts by looking at the Reference Row letters – no more number counting!! Get access to the VIP Vault, full of extra goodies exclusively for subscribers. Enroll in all new beginner’s courses taught by me and other handpicked journaling experts. Thank you for your blog. It really helps me understand everything you are doing. This is so handy to have!! This looks so helpful and pretty at the same time. Thank you for sharing your creative talents with us!! This looks like an amazing time saving tool! Most of the reason I skip weeks is I don’t have time to draw it up because of how slow the counting of squares is. This will be a game changer! I am beginning to this this is a must have product! Will have to make a purchase in the near future! 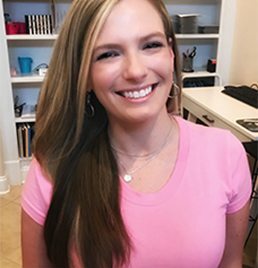 Love your layout ideas and how simple you make them! Love this product! Going to place an order now! I love the door hanger. Use it almost every day. All the heart eyes for these!! This tool looks amazing! Really need tomorrow one! Thank you for my hangers! I love them, love, love, love them!